" The densities are the estimated values in situ, i.e. they are compressed densities. In all cases a predominantly iron core is assumed, with Mars having an appreciable proportion of FeS. reverses the situation, and so in several of the bodies in Figure 5.1 the mantle-core interface is also shown as a solid-liquid interface. Only at a level of greater detail would there be much dispute about any of the features of Figure 5.1 and the data in Tables 5.1 and 5.2. Observational data pertaining to the Earth's interior are particularly copious, and the model is consequently tightly constrained. As well as an abundance of gravitational and magnetic field data, the composition of the Earth's surface is very well known, as are the details of its high level of geological activity. It is the only planetary body for which we have copious seismic data, far more than for the only other body for which we have any seismic data at all - the Moon. Figure 5.3 shows the P and S wave speeds versus depth in the Earth. □ Do the boundaries in the model of the Earth in Figure 5.1 match those in Figure 5.3? The division of the Earth in the model in Figure 5.1 into a crust, mantle, outer and inner cores is apparent in the seismic data. There is plenty of evidence that at all these boundaries there is a change in composition. The disappearance of seismic S waves in the outer core indicates that it is liquid (Section 4.3.1). Their reappearance at greater depths indicates a solid inner core. Iron is highly favoured for the core, because of the density indicated at this depth by the seismic and gravitational data. □ Among the metals, what is another reason for favouring iron? Iron is also favoured because of its high relative abundance in the Solar System. Though iron is dominant throughout the core, models that fit the observational data need up to about 4% nickel in the inner core (similar to iron meteorites), though the exact composition of the inner core is uncertain. The density of the outer core needs to be about 10% lower than the inner core, and its melting point needs to be lower too. Various minor constituents in addition to more nickel can achieve this, such as a few per cent of iron sulphide (FeS), or even iron hydrides (FeHx). These hydrides could contain an amount of hydrogen equivalent to about 100 times that found in the Earth's oceans. The inner core is solid because of its slightly different composition, and because it is at a higher pressure (Figure 4.11). Figure 5.3 P and S wave speeds versus depth in the Earth. lighter elements that float upwards and this also promotes convection. It is estimated that the solid inner core did not begin to form until roughly 1000 Ma ago. This was when the loss of primordial energy from the core had reduced core temperatures to the point where core differentiation started. At present, the inner core is thought to be growing by about 10 mm in radius per century 0.1 km per Ma). At earlier times convection in the then totally liquid core could have been sustained by the general outward loss of heat, and this still makes a significant contribution to convection regardless of crystallisation. In the model the mantle consists of silicates, and from samples of the mantle it is known that the upper mantle consists almost entirely of a rock called peridotite. This is largely a mixture of various silicates - about 60% olivine ((Fe, Mg)2SiO4), about 36% pyroxenes ((Ca, Fe, Mg)2Si2O6, where rarely the metals can be Na, Al, or Ti), and 4% other silicates. 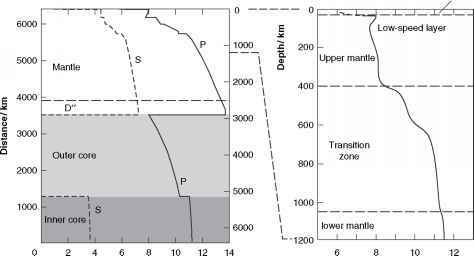 From a depth of about 400 km to about 1050 km there is a gradual transition zone apparent in the seismic speeds (Figure 5.3) that can be explained by the gradual conversion of the minerals in peridotite into higher density crystal structures that are more stable at high pressures. The effect of such changes is particularly apparent around 410 km and 670 km. Such conversions continue down to the core, though the overall chemical composition remains much the same. The sharp changes in the speeds at an average depth of about 30 km mark the boundary between the continental crust and the mantle; oceanic crust is thinner, 5-10 km. This is a chemical change, though the crust, like the mantle, is dominated by silicates. Seismic data indicate various structures in the mantle. Of particular interest is the D" layer that constitutes the lowest 400 km or so. The data are consistent with silicates dominated by (Mg, Fe)SiO3, in various forms, including a mineral called perovskite. Internal layering is also indicated, which could be derived from slabs of the Earth's lithosphere (see below) brought down by mantle convection. The mantle as a whole is thought to contain compounded hydrogen equal in mass to at least that in the Earth's oceans. The overall model composition of the Earth follows fairly closely the Solar System relative abundances of the less volatile elements, as seen in the ordinary chondrites. Iron is underrepre-sented in the mantle and crust because of its concentration in the core. The composition of the crust, which is readily accessible, will be further discussed in Section 8.1.1. Not far below the crust-mantle division, the seismic data in Figure 5.3 reveal a layer with comparatively low speeds, present in much (but not all) of the upper mantle, and extending over the approximate depth range 50-200 km. This indicates that around this depth the material is particularly plastic. This plasticity is consistent with the isostasy of most of the crust. The thermal structure of many models suggests that solid state convection is occurring in the mantle. There is shallow convection around the low-speed layer, and larger scale convection probably extending right down to the core, as indicated by the D" layer. These two types of convective cell are shown schematically in Figure 5.4. 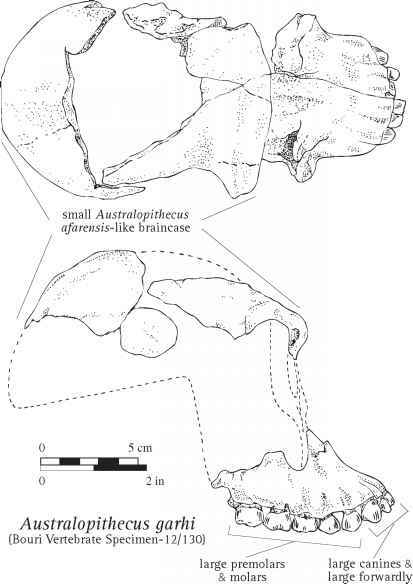 The more plastic region of the mantle constitutes the asthenosphere (from the Greek asthenes, meaning weak). It extends from the base of the lithosphere (see below) to at least a few hundred kilometres, and perhaps right down to the liquid core if that is as far as convection extends. In its upper reaches it seems to incorporate the low-speed layer. Above the asthenosphere, the uppermost part of the mantle and the crust is colder and therefore much tougher, though it is elastic rather than brittle. This is the lithosphere (from the Greek lithos, meaning rock). Its average thickness is about 95 km, with considerable local variations. Note that at the lithosphere-asthenosphere boundary there is a change in dynamic properties, and not a change in composition. 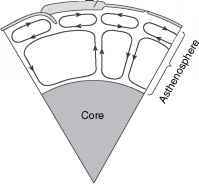 In the lithosphere heat transfer is mainly by conduction, whereas in the asthenosphere it is mainly by convection. Figure 5.4 Convection in the Earth's asthenosphere and the rigid lithosphere. internal convection - the lithosphere does not constitute a stagnant lid. Therefore, plate tectonics makes an essential contribution to raising the rate of cooling of the Earth's interior. There is plenty of evidence that the Earth has had a hot interior ever since its birth about 4600 Ma ago, or not long after. For example, remanent magnetism in radiometrically dated old rocks shows that the Earth's magnetic field extends at least 3500Ma into the past. Therefore, if it formed undifferentiated it would soon have become warm enough to differentiate. Thermal models indicate that long-lived radioactive isotopes are the dominant source of energy for the Earth today. The compositional structure of the Earth, the chemical affinities of these isotopes, and their relative abundances indicate that they are concentrated into the crust and to a lesser extent into the mantle. Heat sources long dead, such as the energy from accretion and from short-lived isotopes, still have an effect, because the Earth's interior temperatures remain a good deal higher than they would be if these extinct sources had never been present. At some time in the Earth's distant future its outer core will probably solidify. Describe two observable effects this would have. In its size and mean density, Venus is almost the Earth's twin (Figure 4.1). When allowance is made for the lower internal pressures in Venus (because of its slightly smaller mean density and radius) then the uncompressed mean densities are even closer, and these densities are a better basis for comparing compositions. Venus is also our planetary neighbour, and therefore probably had available for its construction much the same sort of materials as the Earth. These few data suggest very strongly that the interior of Venus is not very different from the Earth's interior, and this is reflected in the model in Figure 5.1. Support for this conclusion comes from seven of the Soviet spacecraft that landed on the Venusian surface in the 1970s and 1980s. Six of the craft found the sort of silicates that typify the Earth's ocean basins, and the seventh found silicates of the sort that typify the upper parts of the Earth's continents. Further support might be expected from seismic, gravitational, and magnetic field data. Unfortunately, we have no seismic data for Venus, and it is so near to having a spherically symmetrical mass distribution that gravitational data provide very weak constraints on the density versus depth (Table 4.2). The spherical symmetry is largely a result of the slow rotation of Venus, the slowest of all the planets, with a sidereal period of 243 days. □ Why is this relevant? There is little rotational flattening, which is the main cause of departure from spherical symmetry for a planetary body. Evidence of a hot interior is provided by the surface of Venus. Though there is presently no more than modest geological activity, there was a lot more a few hundred million years ago, and the surface displays evidence of a plastic interior (Section 8.2). There is no evidence of plate tectonics and so the lithosphere surely constitutes a stagnant lid on a convecting mantle. In this case, radiogenic heat, produced at roughly the same rate as in the Earth, is escaping only slowly, and the internal temperature must be rising. The dramatic effect of this on the surface is outlined in Section 8.2. That the interior of Venus might well have been kept warmer than had plate tectonics developed makes it likely that a solid inner core has yet to develop. Also, a hot mantle could suppress convection in a liquid iron core. The magnetic field of Venus is extremely weak, and only a very small upper limit exists for the magnetic dipole moment (Table 4.2). This could mean that there is no iron core, or that any iron core is solid. The absence of a liquid iron core would be very surprising in light of Venus's broadly similar size and mass to the Earth. □ As well as an electrically conducting liquid, what other requirements are there for an internally generated magnetic field? Convection currents and sufficiently rapid rotation of the body are also thought to be necessary (Section 4.2). We have already seen that core convection might be absent. Additionally, Venus rotates slowly. Furthermore, the absence of a solid inner core might mean that there would be none of the crystallisation of iron onto an inner core that is thought to help drive convection in the Earth's outer core. Note also that the Earth's solid inner core means that the Earth's conducting fluid is a shell rather than a sphere, and it turns out to be easier to obtain a large magnetic dipole moment from a shell. Thus, in spite of a very weak dipole field, we can retain a liquid iron core in our models of Venus. Overall, taking everything that we know about the interior of Venus, it seems beyond reasonable doubt that it has not only a hot interior, but a liquid iron core and a silicate mantle of broadly similar sizes and compositions to those of the Earth. At a more detailed level of modelling there is far more uncertainty. Observational data on Mercury are sparse. We know the mass and the radius, and so the mean density can be calculated, and it is between that of Venus and the Earth. However, Mercury is a good deal smaller in radius, and so the internal pressures are considerably less. The uncompressed mean density of Mercury is not much less than the mean planetary value of 5430 kg m-3, whereas the mean densities of Venus and the Earth are reduced to 4000-4500 kg m-3 when uncompressed. Therefore, the uncompressed mean density of Mercury is actually greater than that of the Earth, and is the highest of all the planetary bodies. There is only one abundant, sufficiently dense substance that must predominate - iron. Models of the formation of Mercury indicate temperatures high enough for complete differentiation, in which case Mercury has an iron core and a silicate mantle, and the iron core must account for a large fraction of its volume, as in Figure 5.1. Initially, Mercury might have had a silicate-iron ratio more similar to Venus and the Earth, with some of the silicate mantle removed by a large impact after differentiation. The surface has not been sampled, but IR spectroscopic data from Earth-based telescopes indicate the expected silicate composition, in particular feldspars that include calcium, and perhaps pyroxene (Tables 4.3, 6.1). Mercury, because of the high temperatures so close to the Sun. Therefore, the core could be fairly pure iron, and consequently denser. In this case, to meet the mass constraint the mantle would be less dense, such as would be the case if it contained less iron (in the form of FeO). The surface of Mercury (Section 7.2) indicates no internally driven geological activity since very early in Solar System history - it is covered in impact craters that have accumulated over billions of years, with little sign of removal. This lack of activity implies that the lithosphere has long been thick, and this is consistent with the high rate of cooling expected from Mercury's small size. However, a thick, immobile lithosphere would then reduce the cooling rate, which raises the question - is at least some of the iron core still liquid? In this case, Mercury could have a non-negligible magnetic dipole moment. In fact, this is the case (Table 4.2), which indicates that at least some of the iron core is liquid. Thermal models indicate that, with a large iron core cooling slowly by conduction through a largely lithospheric mantle, and with a modest abundance of long-lived radioactive isotopes, the outer part of the core might still be molten, provided that the core contains a small proportion of lighter elements, e.g. sulphur, to reduce the solidification temperature - a core freezing time of about 500 Ma is deduced for a pure iron-nickel core. The inner core, being at a greater pressure and possibly with a slightly different composition, is predicted to be solid, as in the Earth. But even with a liquid shell, Mercury's slow rotation counts against a strong magnetic field being generated. The rather small dipole moment could well be consistent with slow rotation. A less likely possibility is that the observed field is due to iron-rich surface rocks magnetised early in Mercury's history, perhaps by a strong field in an iron core that had not then solidified. In that early time Mercury would also have been rotating faster - its rotation has since been slowed by tidal interactions with the Sun. The existence of a liquid core early in Mercury's history is borne out by the surface topography, which indicates contraction early on, such as would result from the solidification of at least some of the core, but not necessarily all of it. State and justify your expectations regarding the existence and extent of an asthenosphere in Venus and in Mercury. Mars is somewhat larger than Mercury but has the much smaller uncompressed mean density of 3700-3800 kg m-3, which is also significantly smaller than the uncompressed value for the Earth (4000-4500 kg m-3). The surface has been sampled, and from this and other data it is clear that iron-rich silicates are common in the crust. Nevertheless, the low uncompressed mean density indicates that, overall, iron is less abundant in Mars than in the Earth. Seismic data for Mars are very limited, confined to measurements attempted in 1976-1980 by the Viking 2 Lander. No seismic activity was detected, though the winds were stronger than expected, and would have masked all but the strongest seismic events by terrestrial standards. Evidence for a core intrinsically denser than the rest of the planet is provided by the value of C/MR2, given in Table 4.2. □ What is the value of C/MR2 for a homogeneous sphere? For a homogeneous sphere the value is 0.4 (Section 4.1.3). The Martian value of 0.365 is sufficiently smaller to be consistent with a small, iron-rich core. The value of C/MRe2 has been obtained from the rotation period T, the value of the gravitational coefficient J2, and the rotation axis precession period (0.1711 Ma), as outlined in Section 4.1.3. The core is thought to consist of a mixture of iron (with a few per cent of nickel) plus less dense materials such as FeS and perhaps magnetite (Fe3O4), though core pressures might be too low for the latter to be a significant component. Such mixtures arise from thermal models of Mars indicating that differentiation might have been less complete than in the Earth. Incomplete differentiation is also consistent with the iron-rich surface silicates and with models than indicate a higher content of FeO in the mantle than in the case of Earth. Isotopes in Martian meteorites suggest core formation within a few tens of million years of the formation of Mars. Evidence that at least part of the core is liquid is provided by the Love numbers of Mars (Section 4.1.4), derived from the Martian tide raised by the Sun, as observed by Mars Global Surveyor. Even though this tide is only a few millimetres in amplitude at the surface, the associated Love number is too large for a wholly solid interior. Further support for a (partly) liquid core comes from thermal models of Mars. These indicate that a thick lithosphere formed early in Martian history, which is consistent with the gravitational data on a regional scale and with the surface features (Section 7.3). Such a lithosphere could well have acted as a stagnant lid. With a stagnant lid, the core could be warm enough to be (partly) liquid provided that it contains lighter elements, such as sulphur in the form of FeS. It is possible that there is a solid inner core consisting of purer iron-nickel, possibly half the radius of the complete core. Only an upper limit exists for the magnetic dipole moment (Table 4.2), and this is less than 0.003% that of the Earth. Given the rapid rotation of Mars, if indeed part of the core is liquid, this indicates that it is not convecting. One possibility is that there is no solid inner core forming. Such a completely liquid core is possible if the melting point has been sufficiently lowered by other ingredients. If sulphur accounts for more than about 15% of the core, it would be entirely liquid today. However, such a liquid core seems to have generated a magnetic field in the past. The evidence comes from weak remanent magnetism detected in crustal rocks by Mars Global Surveyor, notably in the more ancient areas of Mars, indicating that Mars had a magnetic field that died perhaps as long ago as 4150 Ma. The preferred explanation for this demise is a rather low sulphur content and the consequent early rapid growth of an inner core, followed by slower growth, so that we have since had a non- or weakly convecting liquid shell. The lack of correlation of the remanent magnetism with topography suggests a magnetised layer deeply buried, presumably including iron-rich minerals. Figure 5.1 shows an iron-rich core with a radius near the middle of the 1300-1800 km range of sizes that are all consistent with a mantle of composition suggested by the Martian meteorites and with the measured value of C/MR (Table 4.2). Variations in the detailed composition of the core contribute to the range of radii. The modelled mantles are a few per cent more dense than the Earth's mantle. A greater proportion of FeO (ferrous oxide) remaining in the Martian mantle can account for this, The crust is also iron rich, with Fe2O3 (ferric oxide), which gives Mars its red tint. If FeS were a significant proportion of the core then the mantle would be correspondingly depleted in sulphur. There is some evidence of such depletion from the Martian meteorites. Though they are samples of the crust, they can be used to make inferences about the composition of the mantle, because the crust was derived from the mantle. One model has the upper mantle dominated by olivine, underlain by a denser mix. If the core is sufficiently small, then the pressures at the base of the mantle could be sufficiently high to create a thin shell of the even denser mineral perovskite, as at the base of Earth's mantle. Explain why we would know much less about the interior of Mars if the planet rotated very slowly.